Perfect pan fried fish is easier than you think. 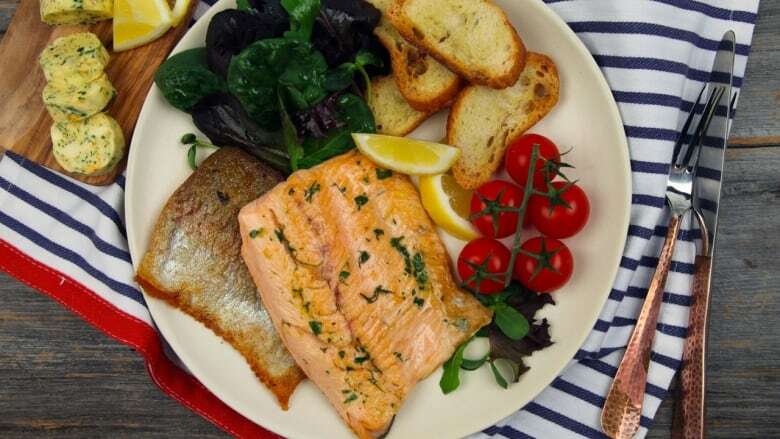 A few easy steps is all it takes for a restaurant quality fish dinner. Heat a non-stick pan over medium high heat. Add 2 tbsp of oil to pan. Place x 2 filets skin side down on the pan, season with salt and pepper. Fry for 5 minutes until skin is crispy. Add ¼ cup of butter to pan, let melt. Tilt pan and use a spoon to scoop melted butter over top of both filets. Continue spooning until top of fish appears cooked. Place pan flat again. Flip fish over for 30 seconds to get slightly browned and immediately remove from pan. Repeat same method with remaining fish. Serve with rice and a side salad or roasted veggies. Mix all ingredients together with a wooden spoon or hand mixer. Lay out a double layer of plastic wrap, about 8 x 10 inch pieces. Transfer butter to centre of plastic wrap. Use plastic wrap to roll butter into a log with a 1.5-2 inch diameter. Twist ends of plastic wrap and tie tightly with butcher's twine. Let chill in fridge for at least 1 hour. Once chilled and firm, it's ready to use. Great for basting fish, steak or with fresh bread. Do not overcook your fish. A bit of pink is desirable. The fish will continue to cook once out of the pan.